A wonderfully scenic trail to a secluded lake basin high above the spectacular canyon of Canyon Creek in the Trinity Alps. All statistics include the initial part of the Canyon Creek Trail which leads to the Boulder Creek Lakes Trail. Sawtooth Peak reflects in the calm water of Boulder Creek Lake. 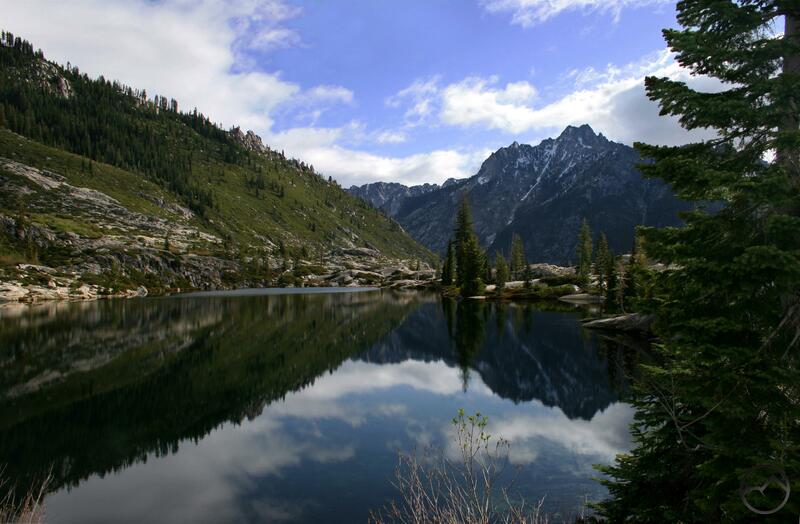 Canyon Creek embodies many of the best features the Trinity Alps have to offer: granite cliffs, glacial cirques, icy lakes and roaring waterfalls. Crowning this sublime mix of mountain real estate is a spectacular cluster of alpine summits. 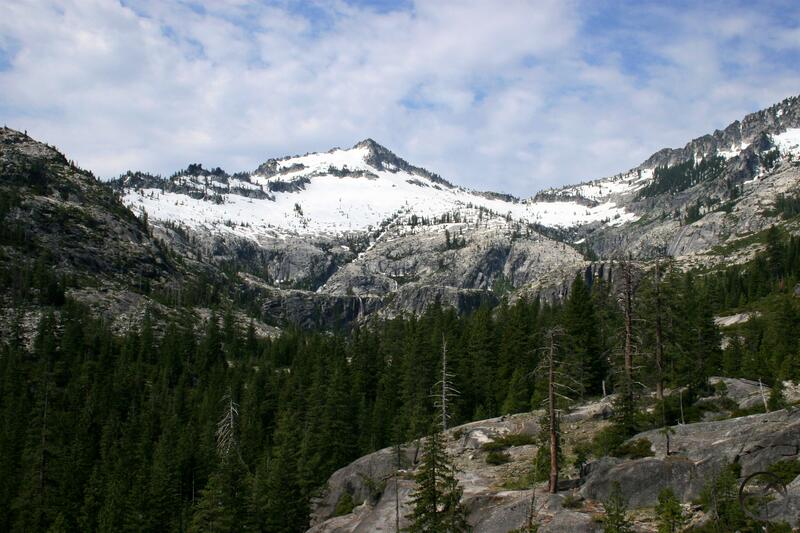 Consisting of all but one of the highest summits in the Trinities, these peaks constitute the ceiling of the Trinity Alps. Numerous lakes lie nestled in cirques gouged into the flanks of these peaks. Most of the traffic along the Canyon Creek trail heads to the north end of the canyon and enjoy the incredible scenery at the Canyon Creek Lakes. In this part of the canyon, Thompson Peak, Wedding Cake and Sawtooth Peak dominate the horizon. Most who venture here are unaware of the many hidden delights found in Canyon Creek. Chief among the hidden treasures of Canyon Creek is the Boulder Creek Lakes basin. Waterfalls entering Bouler Creek Lake. 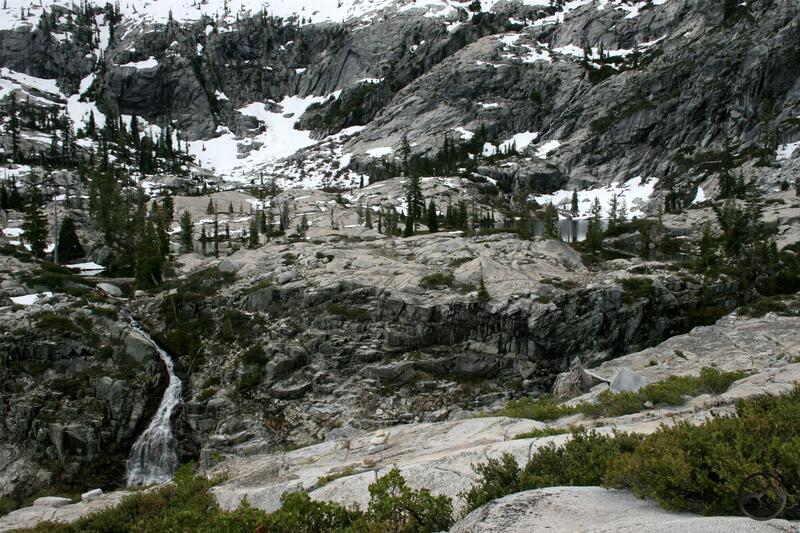 The Boulder Creek Lakes area contains two spectacular glacial cirques. Each cirque contains a primary lake and a few smaller satellite lakes. The larger of the two basins holds the Boulder Creek Lakes. Slightly higher and hidden in an exceedingly narrow cirque are the diminutive but gorgeous Forbidden Lakes. In addition to the lakes, there are an astounding number of waterfalls in the Boulder Creek Lakes area. Cascades seem to crash down every possible cliff face. During high water, Boulder Creek Lake has two outlets. The high water outlet is a beautiful, 50 ft. cascade flowing out of the north side of the lake. The primary outlet is a narrow granite trough the flows east from the lake for a few hundred yards before plunge off of the granite bench that holds the lakes in an excellent 300 foot freefall. Sunset on Sawtooth Peak viewed from the Boulder Creek Lakes. In addition to the excellent lakes and waterfalls, the peaks around the basin are nothing short of stupendous. Across Canyon Creek, Sawtooth Peak thrusts its jagged summit skyward. Many consider Sawtooth to be the signature peak in the Trinity Alps. This is due in part to its prominent visibility from many of the trails in the eastern Trinity Alps and troughout the Mount Shasta area. Indeed, the peak can even be seen from as far away as I-5 as it passes through Red Bluff. The view from the Boulder Creek Lakes basin is one of the best views of this mountain. Mt. Hilton, the third highest peak in the Trinity Alps (Sawtooth Peak is the fourth on the list) presides regally above the lakes. In addition to providing access to the lakes, the Boulder Creek Lakes trail is the primary route to the summit of Mt. Hilton. The Boulder Creek Lakes trail is a spur route stemming from the Canyon Creek trail. In spite of its proximity to the most popular destination in the Trinity Alps, it sees little traffic. Looking up toward the Boulder Creek Lakes from Canyon Creek. From the Canyon Creek trailhead, travel up the canyon for 6.0 miles. For a description of this section of the trail, refer to the Canyon Creek Trail page. Two options exist for reaching the start of the Boulder Creek Lakes trail. The first, and easiest, option is to simply follow the maintained trail to the signed junction. The other option is to follow the use-trail to the base of Middle Canyon Creek Falls and then continue upstream to where the Boulder Creek Lakes trail fords Canyon Creek. The latter is the preferred route. 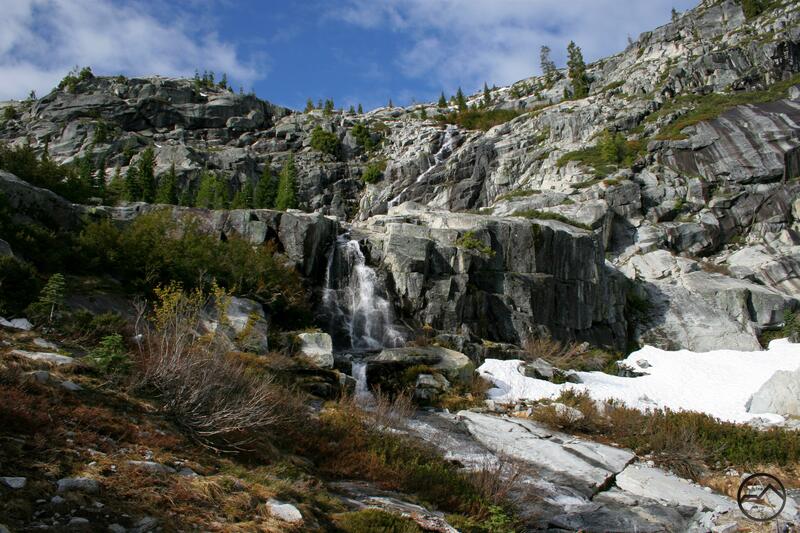 Not only does one have the opportunity to observe a marvelous waterfall, but also the granite slabs at the top of the falls provides the only good vantage point for observing the entirety of the Boulder Creek Lakes basin. It is a spectacular vista. The wide, east facing cirque drained by Boulder Creek can be seen, topped by the pyramidal Peak 8,153. Mt. Hilton looms to the north. Numerous waterfalls can be seen, including the 300 foot waterfall that forms the outlet to the primary lake. The other option to the trail junction is to follow the maintained route. This primarily consists of a stretch of switchbacks that climb through a section of forest. There are no views on this stretch of trail. Whichever way one takes, it is necessary to ford Canyon Creek. This may be one of the primary reasons why the lakes see dramatically less traffic than the rest of Canyon Creek. Care should be taken when fording the creek. When water is high, the creek can be 2.5 to 3.0 ft. deep and is swift and cold. Middle Canyon Creek Falls lies only a short, quick, distance downstream. It should be noted that Canyon Creek is a true mountain waterway. It is wide and powerful and demands respect. Nonetheless, crossing should not be a problem if a little caution is exercised. Converging waterfalls along the Boulder Creek Lakes Trail. Once on the west bank of the creek, the trail leads into the Boulder Creek drainage. Boulder Creek can be heard to the south, but is not visible from the trail. Initially the route is fairly level as it passes through some small meadows. The trail may be marshy in this area. All too soon, it begins to climb. Although there are some steep pitches, the grade is generally moderate for about 0.5 miles. Soon the granite bench containing the Boulder Creek Lakes comes into view and the outlet freefall is clearly visible from here. However, the bench must be climbed. To do this, the trail begins to switchback very steeply up the side of the canyon. This stretch may be another deterrent to would-be visitors to the lakes. All to soon the trail tops out on the bench containing the lakes. Numerous creeks converge in this area, with beautiful cataracts seemingly crashing all around the trails. 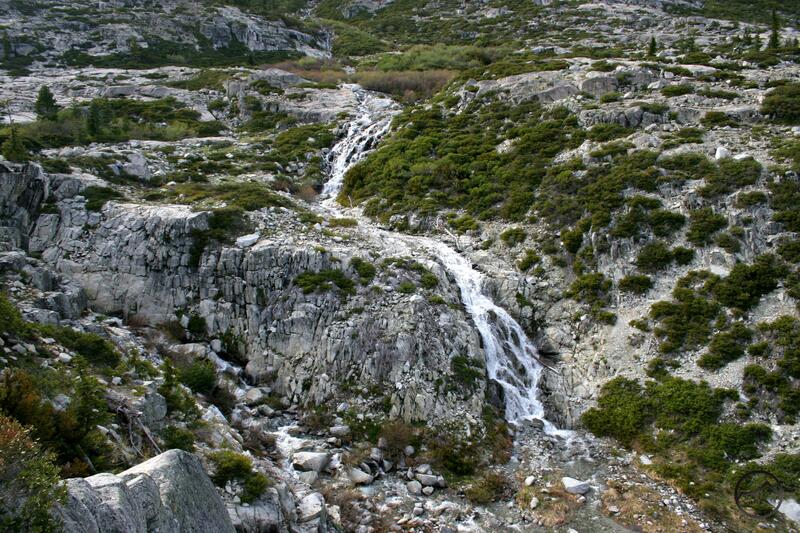 Some of the water cascades down from the flanks of Mt. Hilton. Some of it comes from the hidden cirque containing the Forbidden Lakes. This little narrow cirque sees little sunlight and it is not uncommon for snow to remain here all summer. Some of the cataracts come from snow along the top of the basins headwall, while the rest of it comes from the Boulder Creek Lakes themselves. All the water is funneled into Boulder Creek. It is an inspiring place. Looking toward the Boulder Creek Lakes from across the canyon. The work is not over, however. If one’s destination is the Boulder Creek Lakes, one cannot simply walk to them, even though they are visible from the top of the bench. The reason for this is a large gorge containing the outlet creek flowing from the Forbidden Lakes. The high water outlet for the Boulder Creek Lakes falls into this crevasse. To get around the gorge one simply follows the cairns west for about 0.5 miles to a place where the Forbidden Lakes creek can be crossed easily. 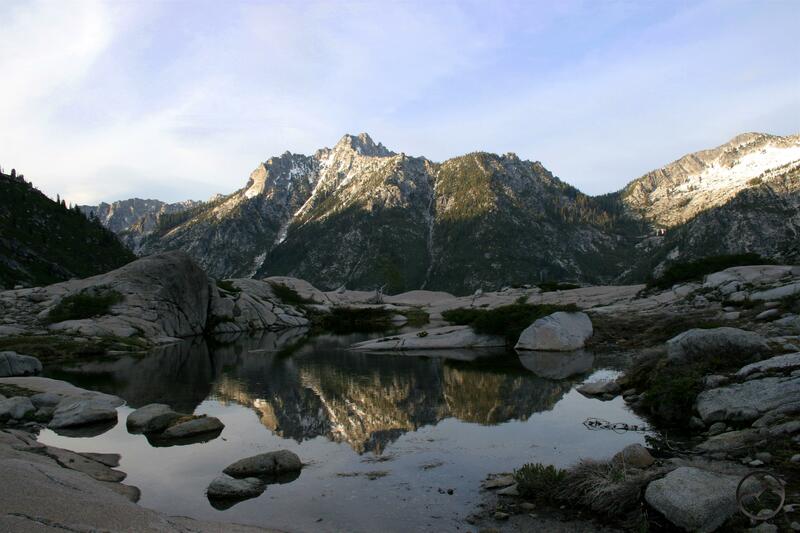 To get to the Forbidden Lakes scramble up the granite slabs immediately after crossing the creek. Continue climbing them as they parallel the outlet creek. This will eventually lead to the cirque containing the lakes. The view of Sawtooth Peak from here is inspiring. Looking towards the lakes from the beginning of the Mt. Hilton route. 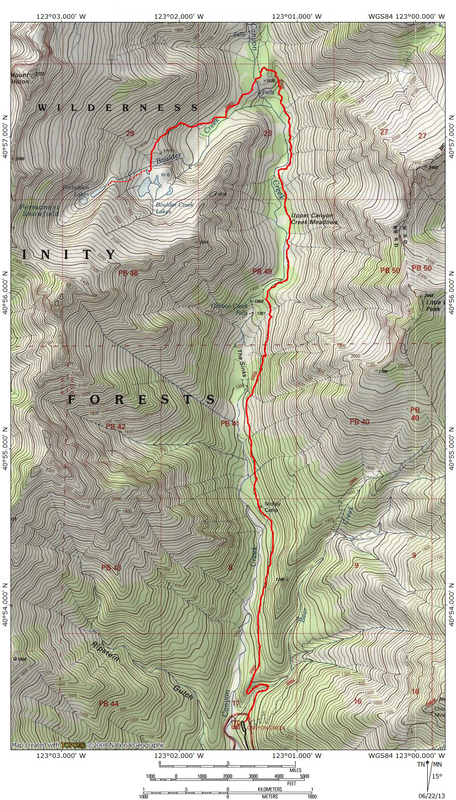 The route to Mt. Hilton is easily discernable from the Boulder Creek Lakes trail, once it tops out on the granite bench. Hilton’s summit can be seen from here and it is simply a matter of scrambling up the long granite slope to the summit. Of course, things are never that easy. The route is steep and there are clumps of chinquapin that must be avoided. The best route is to head north from the Boulder Creek Lakes trail, towards the left base of the serrated ridgeline that runs from Mt. Hilton down towards Canyon Creek. Once the west end of this serrated section is reached turn west and follow the ridge toward the summit. Scrambling is all that is necessary to reach the base to of the summit block. From there, a bit of climbing is necessary. Even if one does not want to attempt the final pitch to the summit, the views are astounding. 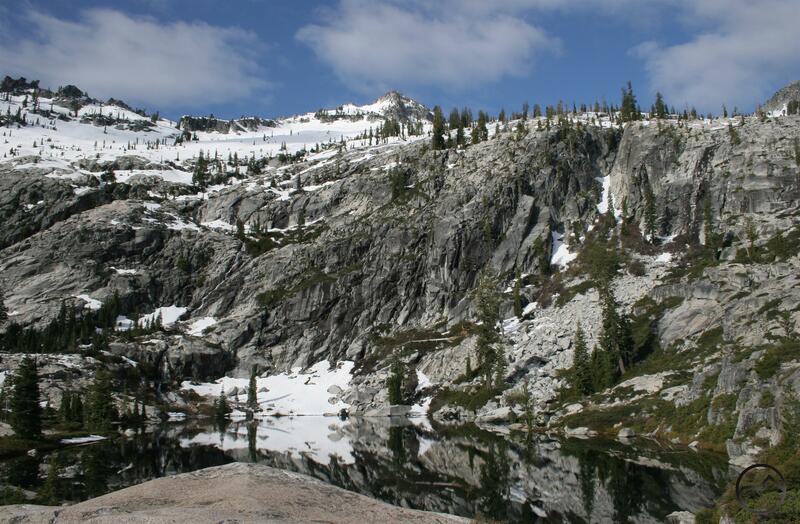 If one does reach the top, it is possible to look to the west toward the massive cirque containing Papoose Lake, one of the Trinity Alps’ premier destinations. Peak 8,153 above Boulder Creek Lake. The Boulder Creek Lakes make a great base camp for trips to the summit of Mt. Hilton. They are also a great destination in their own right. 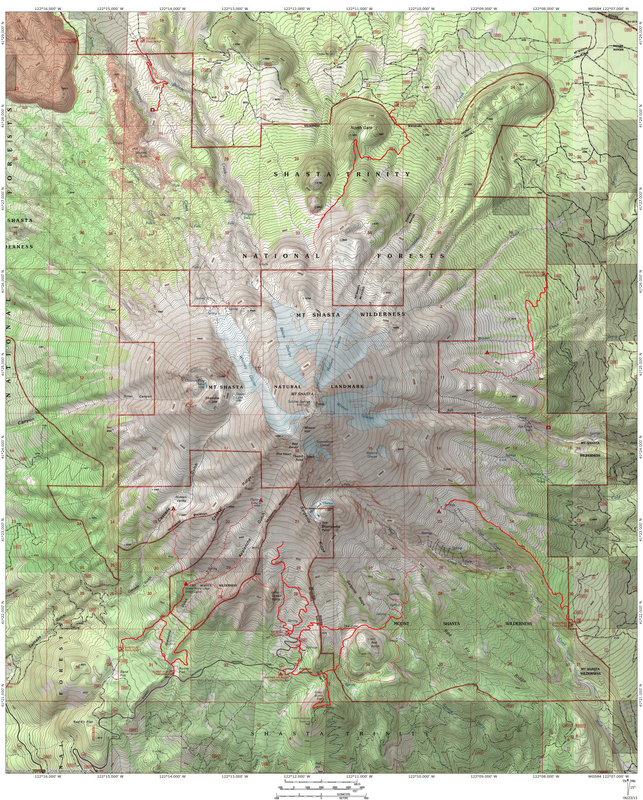 There is an abundance of exploring that can be accomplished from this area, including summiting Peak 8,153. 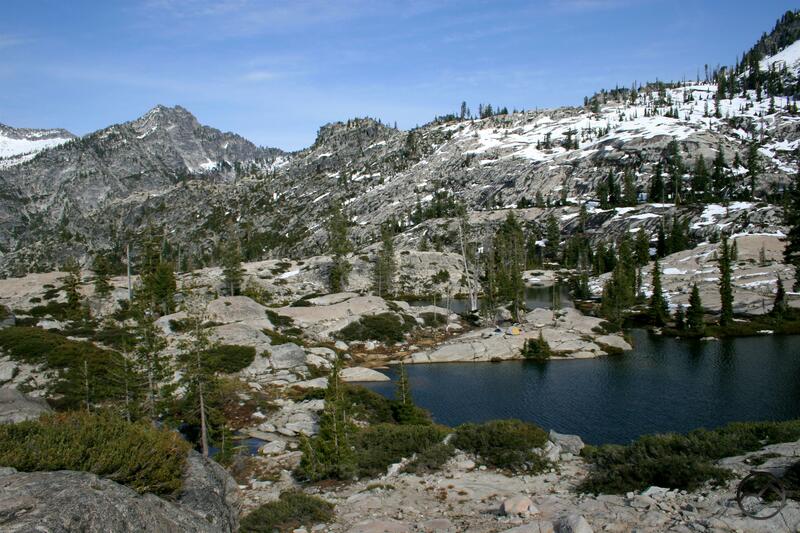 This is also one of the only areas in the Trinity Alps where backcountry technical climbing has been observed. There is certainly a seemingly endless supply of granite with routes waiting to be pioneered. Whatever ones reason for going to the lakes, an evening spent sitting on the ledge of the bench containing the lakes basin, listening to the waterfall crash on the rocks below and watching the sun set on Sawtooth Peak is one of the great treats of the Trinity Alps. From Weaverville, head west 8 miles on Highway 299. At Junction City veer right onto Canyon Creek Road. Drive north 12 miles on the winding, narrow but paved road. Park at the trailhead. Weaverville can be reached from Eureka or Redding on Highway 299.